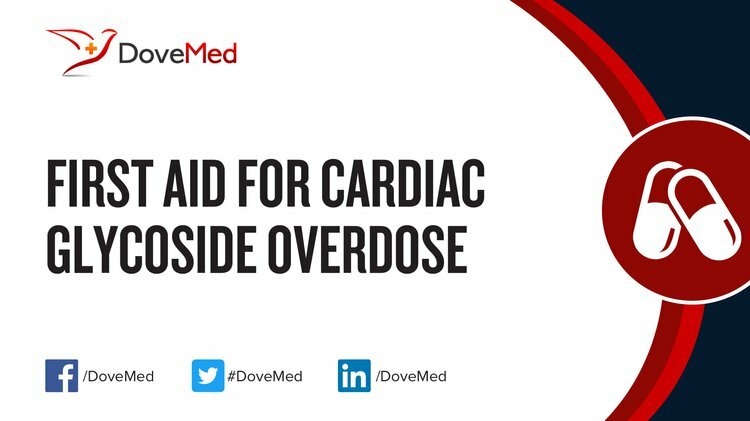 Cardiac Glycoside Overdose is the accidental or intentional intake of the drug in dosage higher than prescribed values. What is Cardiac Glycoside Overdose? What are the Causes of Cardiac Glycoside Overdose? What are the Signs and Symptoms of Cardiac Glycoside Overdose? The signs and symptoms of Cardiac Glycoside Overdose can vary from one individual to another. It may be mild in some and severe in others. Several systems of the body, such as the digestive system, nervous system, respiratory system, vascular system, skin and ENT may be affected. In case of chronic overdose, some individuals may additionally experience appetite loss, appearance of colored halos around objects, depression, and hallucinations. How is First Aid administered for Cardiac Glycoside Overdose? Medically manage symptoms, such as skin condition, abnormal heart rates, etc. Who should administer First Aid for Cardiac Glycoside Overdose? First aid for Cardiac Glycoside Overdose is administered by healthcare professionals. What is the Prognosis of Cardiac Glycoside Overdose? How can Cardiac Glycoside Overdose be Prevented? Kanji, S., & MacLean, R. D. (2012). Cardiac glycoside toxicity: more than 200 years and counting. Critical care clinics, 28(4), 527-535. Hofer-Dueckelmann, C., Prinz, E., Beindl, W., Szymanski, J., Fellhofer, G., Pichler, M., & Schuler, J. (2011). Adverse drug reactions (ADRs) associated with hospital admissions—elderly female patients are at highest risk. International Journal of Clinical Pharmacologyand Therapeutics, 49(10), 577. Roberts, D. M., Gallapatthy, G., Dunuwille, A., & Chan, B. S. (2016). Pharmacological treatment of cardiac glycoside poisoning. British journal of clinical pharmacology, 81(3), 488-495. Gunja, N., & Graudins, A. (2011). Management of cardiac arrest following poisoning. Emergency Medicine Australasia, 23(1), 16-22. Eyer, F., Steimer, W., Müller, C., & Zilker, T. (2010). Free and total digoxin in serum during treatment of acute digoxin poisoning with Fab fragments: case study. American Journal of Critical Care, 19(4), 391-387. Liao, W. I., Lin, Y. Y., Chu, S. J., Hsu, C. W., & Tsai, S. H. (2010). Bradyarrhythmia caused by ginseng in a patient with chronic kidney disease. The American journal of emergency medicine, 28(4), 538-e5. Patel, S. (2016). Plant-derived cardiac glycosides: Role in heart ailments and cancer management. Biomedicine & Pharmacotherapy, 84, 1036-1041.